Micah, Vernon, and Beryl Domingo at Thanksgiving 2017. During a recent session at the Bridgewater Public Library, Vernon and Beryl Domingo gave a slideshow and talk on transgender rights, explaining terms like “cis gender” and “gender nonconformity” to a large group, many of them new to the subject. It isn’t the first time the couple has been in a political fight. Classified “colored” in their native South Africa, they were outspoken anti-apartheid foes and were expelled from their university. But this time the fight is even more personal. It’s about their child. Today, Micah lives with his partner in Brooklyn, N.Y., where he is a data analyst at a health care center. He’s the beloved uncle of his older brother’s two children, and the extended family remains close. But his parents know that many transgender people are rejected by their families, and are targets of hate and violence. That’s another reason why Vernon, a retired professor from Bridgewater State University, and Beryl, a retired social worker with the state Department of Children and Families, have gone public with their family’s story. Massachusetts is among 19 states, along with Washington, D.C., that have anti-discrimination laws protecting transgender people. Here, the law prohibits discrimination based on gender identity regarding housing, employment, credit, college education, and public accommodations. The latter category includes hotels, inns, restaurants, bars, theaters, concert halls, sports stadiums, auditoriums and lecture halls, hospitals, stores, and shopping centers. The law includes the right to use the restroom that conforms to one’s gender identity. Dianne and Leon Monnin of Medford have also jumped into the campaign to educate voters about the referendum to repeal such protections. 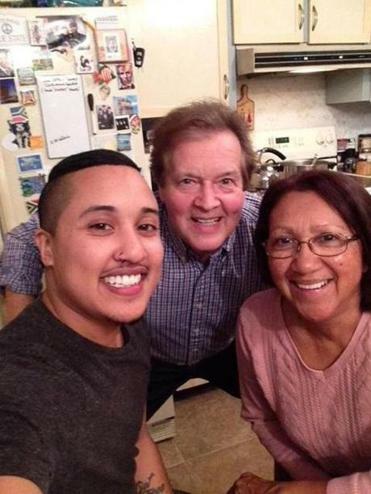 Their son came out to them as gay in high school and as transgender in college. Now 35, he’s a nurse practitioner who lives in California with his partner. The opposition group, Keep MA Safe, is indeed painting it as “the Bathroom Law,” for which it collected 32,375 certified signatures needed to put it on the ballot for repeal. “The bill would endanger the privacy and safety of women and children in public bathrooms, locker rooms and dressing rooms ...” according to the group’s website. Kasey Suffredini is co-chairman of Freedom for All Massachusetts, which is working to preserve the public accommodations law. “Transgender people should have the same protections as everyone else in Massachuseets, to go about their lives feeling safe, to be able to run their errands in places like grocery stores and banks,” he says. The Domingos and the Monnins are eager to speak to whatever groups will listen to them on the topics of acceptance and equality. They understand that it takes some people time to understand the issues. And they agree that they themselves have learned a lot from their kids. Bella English writes from Milton. She can be reached at english@globe.com.